February has arrived, and with it comes Black History Month, an opportunity to celebrate the rich history, culture, accomplishments, and perseverance of African Americans, and the integral role they have played in the ongoing story of America. Within this tale, Boston has been the backdrop for many unique chapters and characters, from Lewis Hayden to Lewis Latimer, Phillis Wheatley to William Nell, Prince Hall to Martin Luther King, Jr. Each of these figures called Boston home for a significant period, and all left an indelible mark on the city. And for a city known for its political history and activism, some of Boston’s most salient civic moments stemmed from important epochs in African American history; consider a fiery Frederick Douglass speech in the African Meeting House, or the recruitment of the 54th Massachusetts Regiment, or Dr. King’s civil rights march from Roxbury to Boston Common. These are pivotal moments in the course of this country. Experience Black History Month in Boston by attending performances, joining discussions, and touring resonant landmarks. Start in Beacon Hill at the Museum of African American History and check out the remarkable exhibition Picturing Frederick Douglass. The exhibition features photographs of Douglass covering more than a half-century, telling the story of a self-emancipated man’s journey to transform the United States. Dozens of forgotten or previously unpublished photographs of Douglass make the exhibition all the more evocative. In the neighboring African Meeting House, one can still sense vestiges of Douglass’s vigorous speech during the Civil War. The Museum and Meeting House are pillars of a greater story of African American history on Beacon Hill’s northern slope. The Black Heritage Trail weaves together these locations to reveal a vibrant 19th century community. Explore the trail and immerse in this history, it tells a story of Boston that is as critical as any other, including the American Revolution. 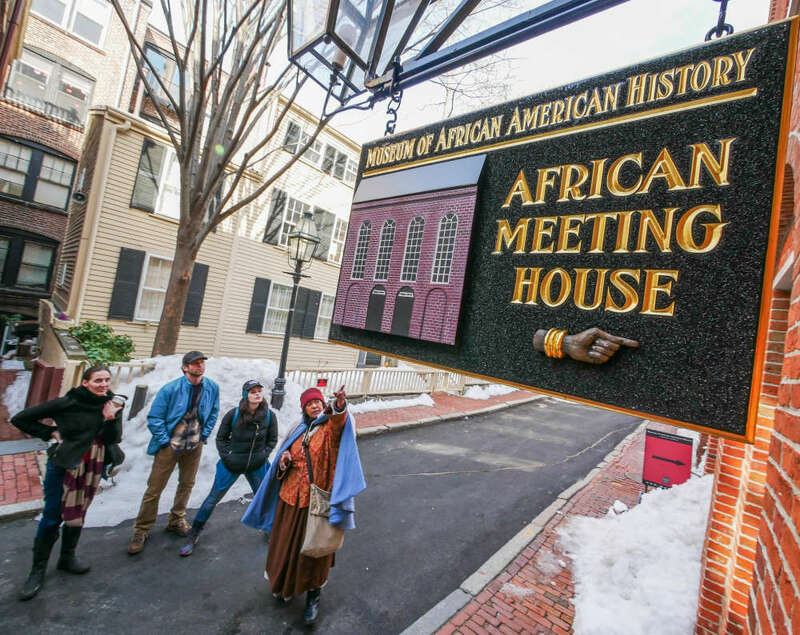 The Freedom Trail Foundation offers an African American Patriots’ Tour during February that covers parts of the Black Heritage Trail, while also visiting traditional Freedom Trail sites and emphasizing the role of African American leaders, activists and statesmen. There are several noteworthy performances and discussions on tap that will enrich civic education during Black History Month. On February 13, educators from the Museum of African American History, National Park Service, Old South Meeting House, Paul Revere House, Boston University, and Northeastern University will participate in a dynamic conversation as part of the Talking About Slavery at Historic Sites and Museums series at the Old South Meeting House. The following day, February 14, head to the Melnea A. Cass Recreational Complex to experience Black Migration “The Journey that Connects Us.” Starting on February 17, the Mary Baker Eddy Library teams up with Sweet Blackberry to produce a week of programming around aviation, invention, dance and art-making that will showcase little known stories of African American history. The JFK Library’s wonderful Celebrate! series will honor the life of an American icon, Rosa Parks, with a production on February 20 featuring original songs and inspirational scenes of how Parks dealt with discrimination and inequity in her life leading up to the famous bus incident in Montgomery, Alabama. And on February 21, a poignantly provocative screening of Clennon King&apos;s documentary "Fair Game" will be shown at the National Center of Afro-American Artists, chronicling the harrowing tale of a black veteran from New Jersey sentenced to death for a crime he did not commit in a Georgia town notorious for lynchings. As Black History Month draws to a close, the Dorchester Community Center will host Dream Chasers – One Mic, Many Voices on February 27, and the harmonizing beauty of the Boston Children’s Chorus will perform She Persisted at Hibernian Hall on February 28.